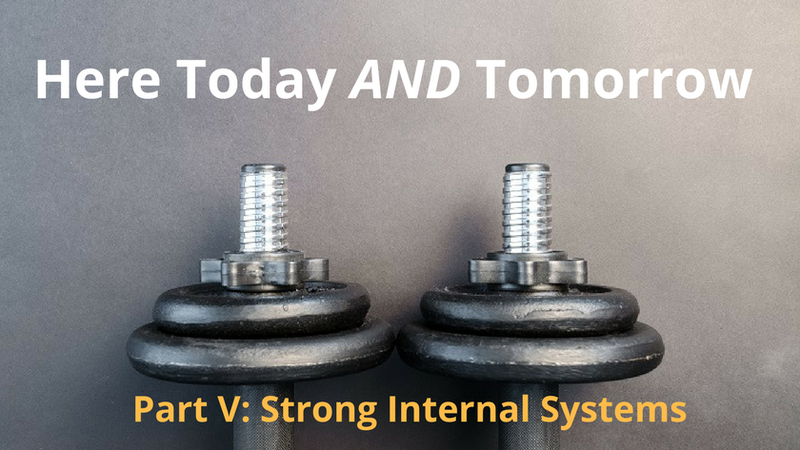 Here Today AND Tomorrow Part V: Strong Internal Systems - Social Entrepreneurs, Inc.
Strong internal systems allow an organization to work effectively and efficiently, even in changing conditions. When an organization has strong internal systems, the staff and board members can perform at their best, and the organization has what it needs to deliver on its mission over the long haul. And the long haul is really why we are here, right? Strong internal systems help to ensure that the programs delivered are of high quality and meet the needs of the community and participants. What do we mean when we talk about internal systems? Consider functions and processes that help you plan and carry out your work such as accounting, reporting, program evaluation, and hiring. Data gathered from these internal systems can help you to refine your approach. For example, a report from your accounting system with budget versus actual can provide you with important information to adjust expenditures or increase fundraising efforts. By regularly monitoring the information and data from these internal systems, changes can be made to continually strengthen efforts. Now, return to the results of your organizational assessment (see Part II of this blog series). No matter what type of assessment you completed, you should have a sense of how your internal systems are working. Some internal systems to consider as part of this assessment include fiscal management and accounting, marketing and communications, governance, and human resources. Where specifically are there strengths? How can you build on these strengths? Are there any areas for growth? What are they? How can your organization work to build its capacity in the areas identified for growth? In working to answer these questions, consider the diverse perspectives of organizational stakeholders (staff, board members, clients, etc.). Participating in a dialogue based on your assessment with key stakeholders within your organization will help you reach a consensus about your strengths and areas for growth. Even more importantly, engaging with your team will allow you to move forward as a team to build the stronger systems you seek. Once you have identified your strengths, celebrate them (and record them in your sustainability plan). Consider focusing on three to five organizational strengths and get clear about why your organization believes them to be strengths. Then choose three to five areas for growth, as applicable. Be honest and kind in your conversation. As you reach consensus via dialogue about areas for growth, also discuss how you will actively build capacity in those areas. Finally, prioritize these areas for growth. What can you realistically deal with in the short term (within 12 months), mid-term (2 years) and long-term (3+ years)? What will make the most difference? Remember, by honestly assessing your internal systems and identifying areas for growth and capacity building, you are strengthening your foundation. A sturdy foundation will allow your organization to weather any potential changes or storms; strong internal systems are the bedrock of sustainable organizations. Join us soon for Part VI of this series, a discussion of Adapting to Changing Conditions.